The advantage of anything canned is that if you maintain a minimal level of vigilance (if the top’s bulging, you know there’s a risk of Botulism, so don’t consume the contents of that can), you can derive a maximum of eating convenience. Back in 1995 I had fun writing Canned adobo and other S&T adventures, showing how before the war, being able to can Adobo was considered a highlight of Filipino scientific achievement. The problem with something canned, though, is that it’s a set recipe. You could turn the canned item into something else by making it part of a recipe, but that defeats the purpose of having handy, canned food, doesn’t it? The point of bachelor living is you have better things to do than actually fuss around the kitchen. So, the easiest thing to do, requiring minimal effort, is to combine one canned thing, with another canned thing, and warm it up in the Microwave. 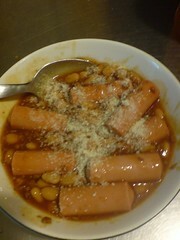 Last night’s piece de resistance was Beantastic South of the Border Vienna Sausages. Amazingly easy! 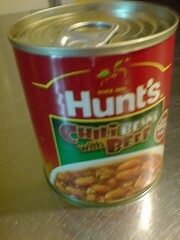 A can of Chili Beans with Beef. Usually, this is too spicy to eat on its own, unless you have it with rice, but if you don’t have any rice to eat it with, then you need something to cut the spice. And a can of Chicken Vienna Sausages. 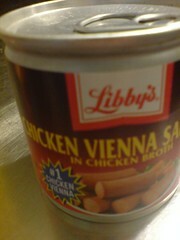 Actually, I prefer normal Vienna Sausages but these were on sale. Open each can. Pour the Chili Beans with Beef into a microwave-safe bowl. 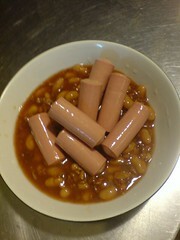 Pour out the broth from the can of Vienna Sausages, then plop the sausages over the Chili and Beans. Sprinkle some Kraft Parmesan Cheese (grated Cheddar would be better, but since it doesn’t come pre-grated in a can, it’s too much of a bother to be grating at midnight) over the whole thing. Let it sit happily for a couple of minutes so the sausages absorb some of the sauce, and consume!